Yes, Slash will share the stage with Axl – in Dubai! 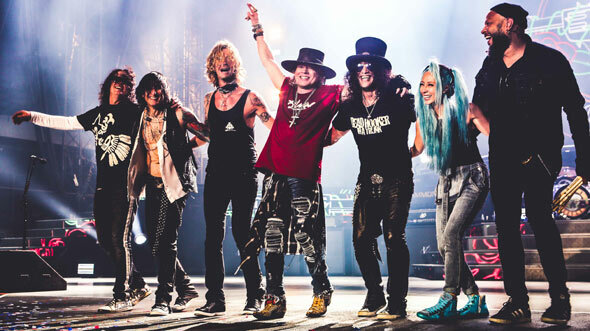 For the first time ever Guns N’ Roses will take to the stage in Dubai, with the legendary rock band playing in the emirate on March 3 2017 as part of their Not In This Lifetime tour. This isn’t a made up Guns N’ Roses either, oh no, the group that will play at the Autism Rocks arena next year are made up of original band members Axl Rose on vocals, Duff McKagan on bass, and Slash on lead guitar. Dizzy Reed, who joined the band in 1990 will be on the keyboard, Richard Fortus (2002) on rhythm guitar, Frank Ferrer (2006) on drums and Melissa Reese is joining the band this year for keyboard and back up vocals. Most fans thought that the band’s 1993 set in Buenos Aires would be the last time Axl and Slash would ever played together, so this year’s revival of the pairing, and their headlining of Coachella was a very welcome surprise. The band formed in 1985 and quickly took over the LA rock scene, giving straight-up rock-n-roll a Renaissance in the era of big-hair bands. Their 1987 debut Appetite for Destruction was the best selling US debut ever, moving 30 million copies globally. Six albums later, they’re undoubtedly one of the most important rock bands in music history. Their many hits are basically every rock cover band in the world’s bread and butter, so you can expect plenty of sing-alongs on the night. Their Dubai gig will see a 30,000-strong crown moshing out at the Autism Rocks arena (which is near Dubai Outlet Mall). Are you a super fan that’s freaking out right about now? Well you can pre-register for tickets here to be one of the first to receive the link to tickets when they’re available. We’ll let you know as soon as tickets are on sale.